Why does everyone love Wits and Wagers? Because you don't need to know the answers to win! The fun is betting on the best guess! Read a fun question... Everyone writes down a guess. No idea? Bet on any guess and hope to get lucky! Riotous fun, and top quality production values! That's how I would describe this reprint of the classic Wits and Wagers game. Components have been upgraded from the dry wipe pens and boards, to the roll out cloth and the fantastic poker chip style base bets. I played a few games of this over Christmas and it plays fantastically well as a party game. It provided some of the best laughs over Christmas, with some players providing some truly ludicrous answers Players are read a question and then note down their numerical answers. These are collected and arranged on the betting play mat. Bets are placed on the right answer, and then winnings (or losses) are collected! It is great when people start getting cocky and start wagering most of their money on an answer! This is simple fun but plays in a short space of time and plays up to 7 I believe without bogging down at all. 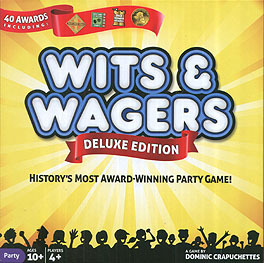 If you're looking for a good fun party game with stellar production then buy this deluxe edition of Wits and Wagers.